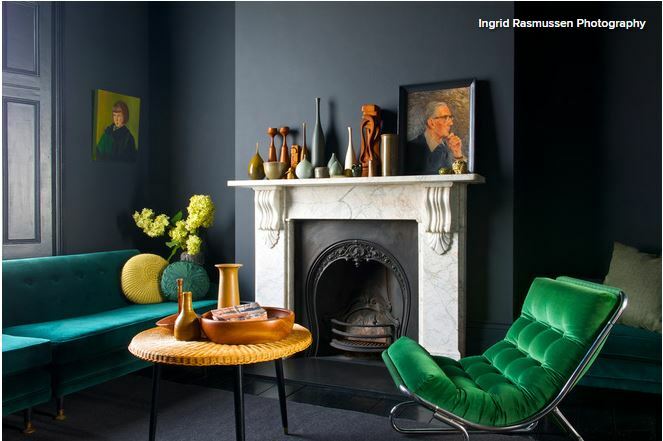 When it comes to using black colour in your home interior, many may fear the hue will be too dark and gloomy. 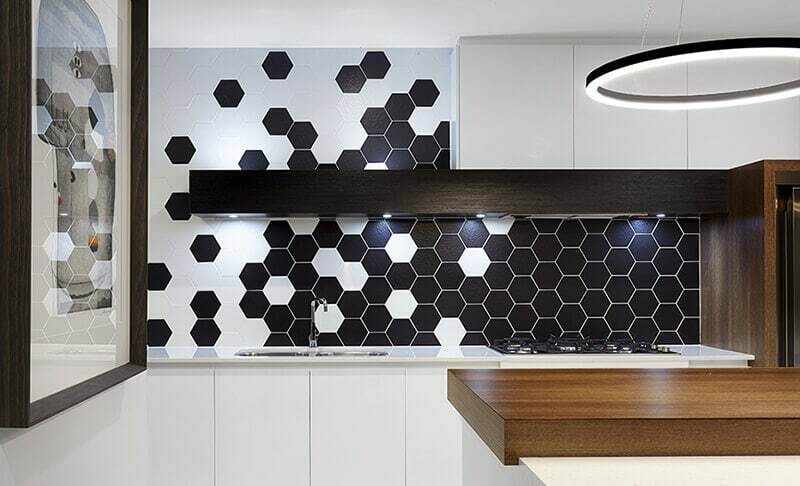 But sometimes, interior design can be as simple as black and white. Black will always add elegance, refinement and style to a room. It works great as an accent colour to create some contract. When used in combination with other colours, it can also give a bold and dramatic look to any room. It is important, however, to get the right balance. 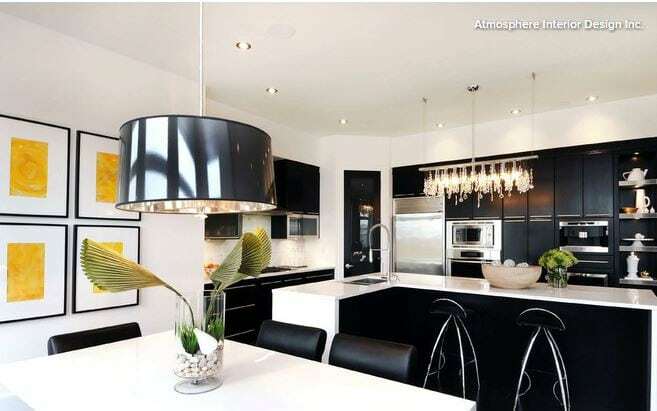 If too much black is used, then it can get too heavy, dark or even make the space look small. So if you are looking to create a ‘wow’ factor in your home, here are some ideas to get you started. This classic combination makes any room sophisticated, timeless and chic. The best way to make this pair work together is to use them equally on a large scale. 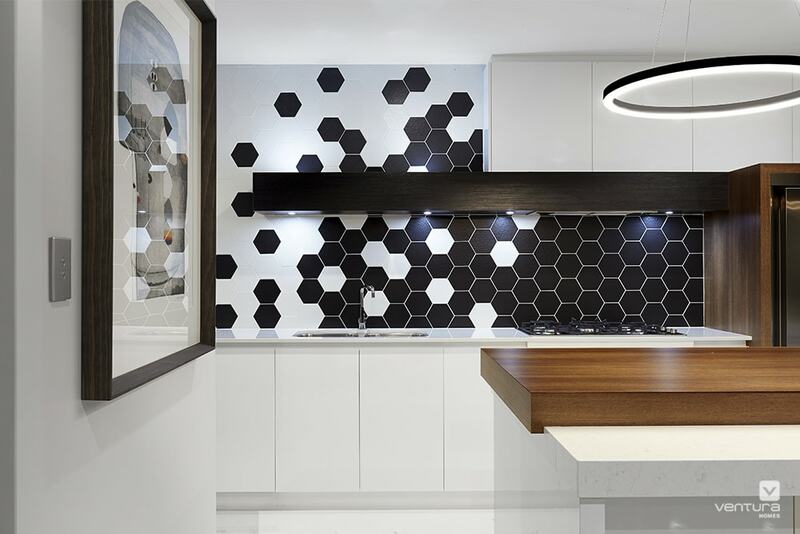 Striking black and white splashback is a great way to make a bold statement in your kitchen. The timber bench top creates the perfect balance between the white cabinets and the black panel above the cooktop and sink. 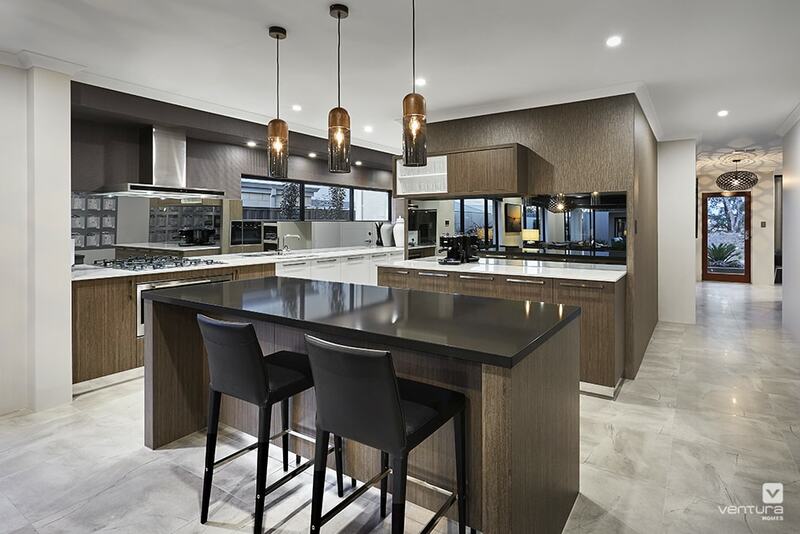 Pictured: The Edge Display Home by Ventura Homes. 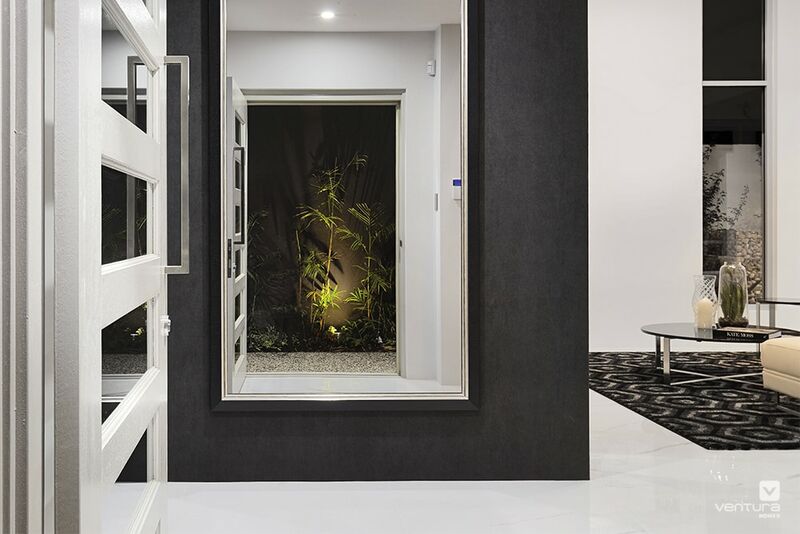 Stunning entryway using a black accent wall with a large mirror, which creates the perfect contrast with the marble floor and white door. Pictured: The Edge Display Home by Ventura Homes. When using black and brown together, you may run into an issue with your room feeling too dark. To help balance it out, incorporate elements with a light neutral shade into your décor. The combination of the sleek black stone in the island bench and black stools enhances the beauty of this dark brown kitchen. 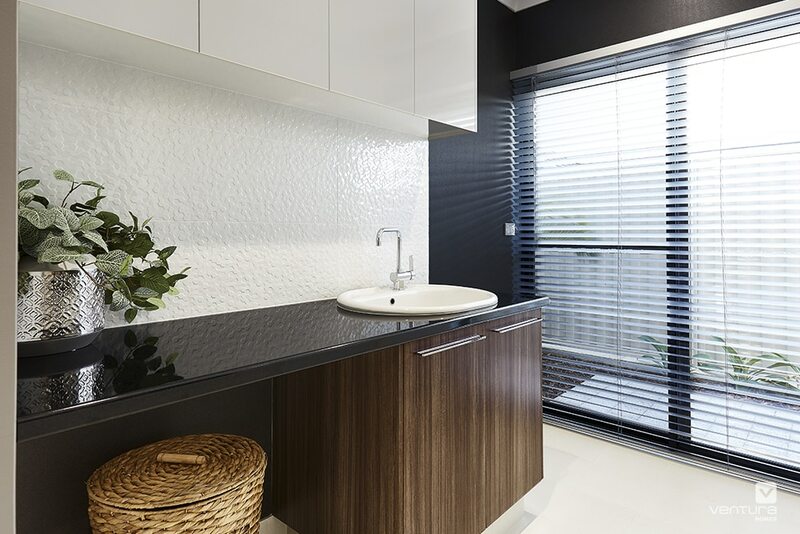 To add a contrast with the dark colours, the mirror splashback, white cabinets and bench tops creates the perfect balance. Pictured: The Key Largo Display Home by Ventura Homes. The black accent wall adds a visual power to this laundry area. The textured white tiles and top cabinets provides the perfect balance, contrasting with the black stone top and brown cabinets. Pictured: The Manhattan II Display Home by Ventura Homes. This dynamic duo is both bold and full of energy. 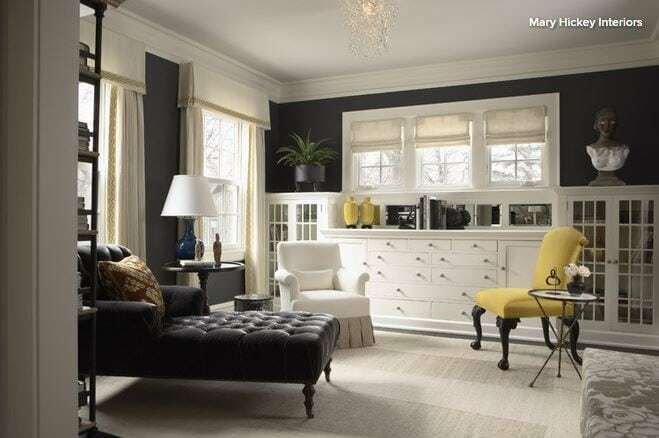 Mixing black with bright yellow details will give your room a modern, fresh look, and add a vibrant feel to your décor. The combination of green hues with a black décor can help enliven the space and give a more sophisticated look to your room. Whether you use one as a colour base and the other as an accent, the green shade will add a natural look to any interior. 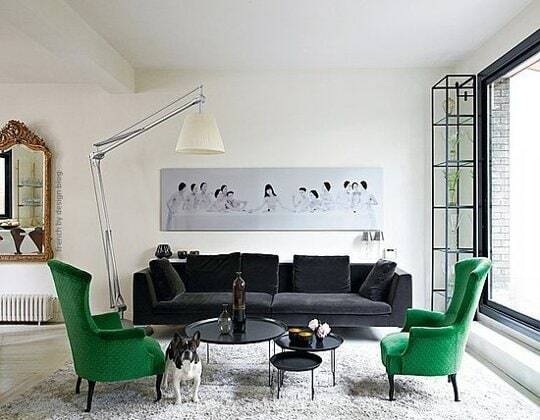 Green wingback chairs creates the perfect balance with the black upholstery in this living room. Source: Apartment Therapy. If you are looking for more interior décor inspiration, see our “How to incorporate dark shades in your home”.